Morton's CustomLab program provides full-service custom publishing with the same high-quality product, personal customer service, and affordable pricing that you have come to expect with our best-selling line of lab manuals, photographic atlases, and dissection guides. Choose the option that best suits your needs and we will work with you to create your ideal lab manual. We strive to make the customization process as smooth as possible for you. It is our goal to earn your business and to ensure that you are happy with your custom lab manual. All Morton titles are delivered three-hole drilled, loose-leaf, and shrink-wrapped to allow students to incorporate other class materials into their lab manual. Morton believes our customers should be happy with their CustomLab manual. We print our CustomLab manuals on demand so there is no contractual obligation. Enrollment minimums apply. For more information please contact our CustomLab Editor. Customize an existing Morton manual. 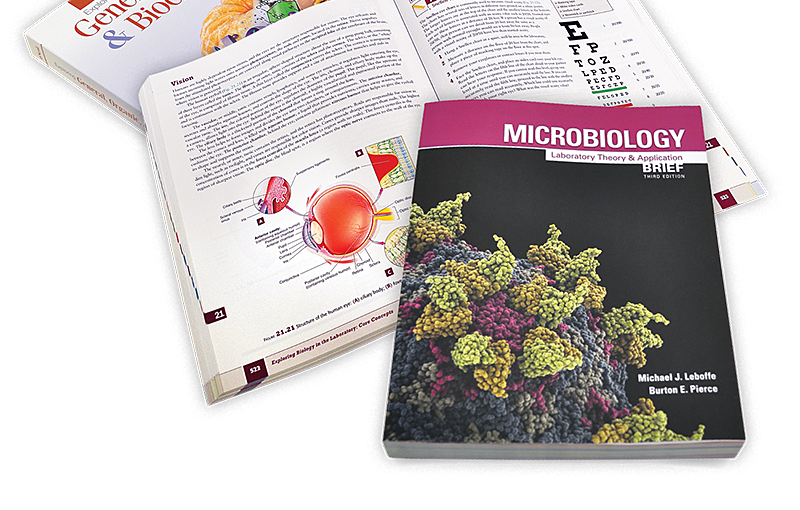 Choose a lab manual from our customizable titles. Select the sections you want to include in your custom publication. Customize any of our best-selling lab manuals and select only the labs you want included. Get a high-quality manual with only the exercises you need. Create a manual from your original material. Submit your "camera-ready" manuscript, and we will print and deliver it to your bookstore at an affordable price. You will retain the copyright for all of your original material. Submit your "camera-ready" manuscript, and we will print and deliver it to your bookstore at an affordable price. Morton will print exactly what you send in to us. You can provide your own cover or we can create a custom cover for you. This type of project may also include a royalty, which can go directly to the author(s) of the manual, or to the department to help offset lab costs. You will retain the copyright for all your original material. Option 1: Your words, our pictures, typeset. Option 2: Your words, your pictures, typeset. Option 3: Mix and match your material with ours and typeset. The hybrid options allow you to create and develop a lab manual specific to your course needs. Mix your material, our labs, exercises, and images to create a truly customized, professionally produced lab manual built from the best of your material and ours. All of our CustomLab hybrid options include typesetting which gives your manual a professionally produced look. We have a dedicated Custom Editor, Adam Jones, who will oversee your custom project from the beginning to end. He will answer your questions, collect your manuscript, manage it through the production process, provide a price quote, create an ISBN, and ensure the project is printed and delivered on time. For annual enrollments of 300 students or more, we can typeset your custom manual. "Typesetting" is the process of taking your manuscript (e.g. Microsoft Word document) and putting it into a design so that it has a professional layout. By using our typesetting service, it allows you to spend more time on the content and less time on the formatting. We have thousands of beautiful photographs and professionally drawn illustrations in our image library. You may include these photographs and illustrations in your custom lab manual. Morton can print and deliver your custom manual to the bookstore. Custom books are "print on demand" meaning that the book is printed when an order is received, with a typical turnaround of just a few days.